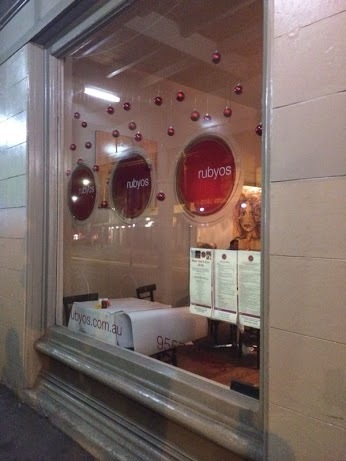 Rubyos in Newtown was the preferred destination for my friends and I on New Years Eve in 2013. 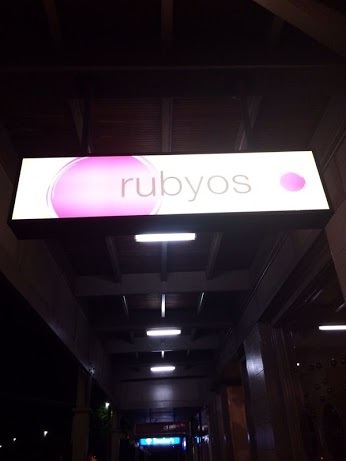 I had never been to Rubyos before, and looked forward to dining at a new restaurant to kick off the beginning of a new year. I arrived a little earlier than our booking time, and was seated by one of the waitresses. I found the member of staff who greeted me to be very friendly and personable. In general, the service was excellent all throughout the night. It's not that often that you find really good service in dining establishments anymore, and I thought that this was one of the best parts about my experience at Rubyos. The décor was minimal. Chic white tablecloths, wooden chairs and floorboards. There were two separate dining rooms, with glass windows that looked onto the street outside. 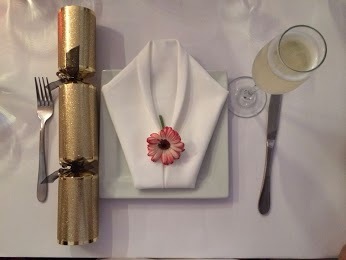 There were little flowers arranged with each place setting. It was very cute and original. After my friends had arrived, we didn't go into the usual routine of ordering, as there was a special New Years Eve banquet menu being served that night. The banquet menu was 12 courses for the amount of $109, including a complimentary glass of sparkling wine. Once everyone had arrived, the staff filled our glasses, and our first course arrived shortly after. 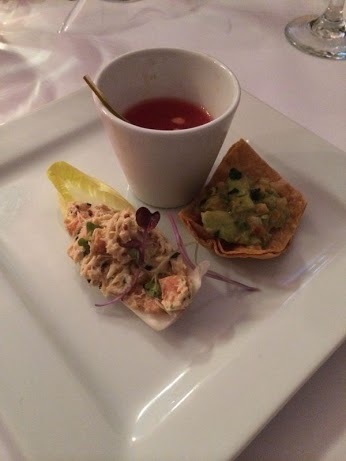 It consisted of an arrangement of a crab taco; ceviche of ocean trout, and a watermelon margarita shooter. 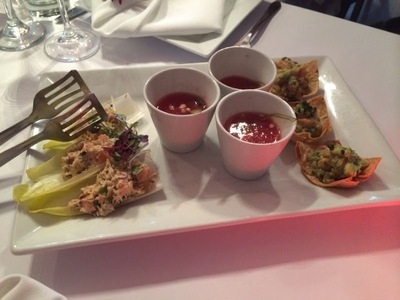 All the appetisers of the first course were cool and refreshing. The watermelon margarita shooter was accompanied by an oyster and pickled melon rind. The flavours of the watermelon juice were stronger than anything else. The ceviche of ocean trout was mixed with avocado, chilli, citrus and witlof. It was served on a small shell, and the differing textures of crisp and creamy was interesting. The crab taco was served on a leaf of lettuce. The taste of the crab was accentuated by chives, lemon and sweet potato. However, the lemon didn't do much for the taste overall. Second course - salad of broccoli, feta cheese and cherry tomatoes. Next up was a salad dish. 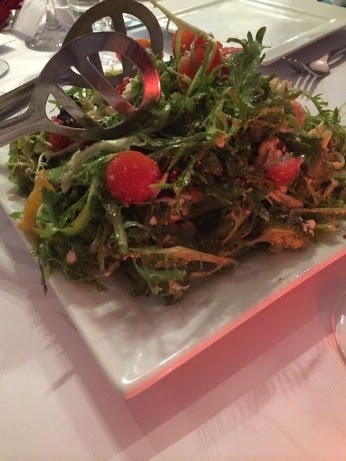 Advertised on the menu as a salad of broccoli, feta and cherry tomatoes; this course did not disappoint. Generally I'm not a big fan of salads ,and will never order them when eating out, but I ate every bite of this one with relish. Hazelnuts and a light dressing added dimension to the salad. I particularly enjoyed the creaminess of the feta cheese combined with the acidity of the cherry tomatoes. 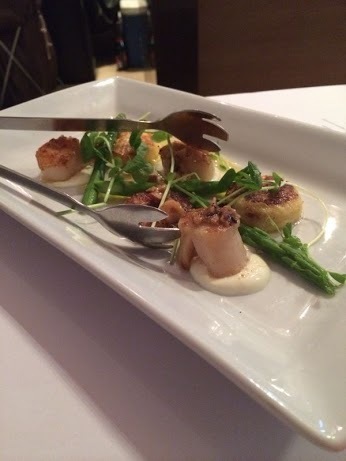 For the third course, we were served seared scallops with semolina gnocchi, asparagus, and lime and hazelnut butter. The scallops were one of my favourite courses. They were large, thick and cooked just right to bring out the delicate flavour. They paired well with the gnocchi, as well as with the lime & hazelnut butter. It was just the right combination of ingredients. The only bad thing was that I was left wanting more. 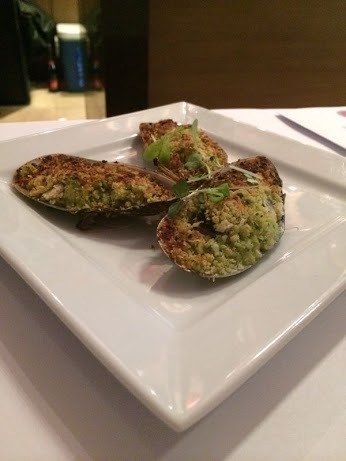 The fourth course of the stuffed green lip mussels was also good. The mussels were crumbed and stuffed with a pecorino cheese, garlic shoots, and a lime and brioche strudel. The predominant flavour in the stuffed mussels were cheese, but the strong flavour of the cheese made it difficult to really taste anything else. 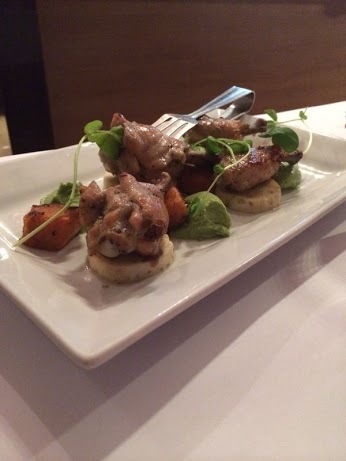 The next course was a confit of chicken drumettes that came with boudin blanc and a green pea mousse. The chicken was a bit bland on its own, but was good when eaten with the pea mousse. I thought the boudin blanc was a little bit dry. The chicken was one of the dishes that was more of a hit and miss. After the chicken, we had a course of Korean style soybean and chilli prawns. There was a distinct Asian flavour to this dish, but I would not have said that it tasted like Korean cuisine. It tasted more like they had been trying to channel Malaysian or Thai cuisine. The prawns were another course that I didn't really enjoy. It seems like they had mixed up different Asian flavours. I'm guessing that this was unintentional as it was titled as 'Korean' on the menu. 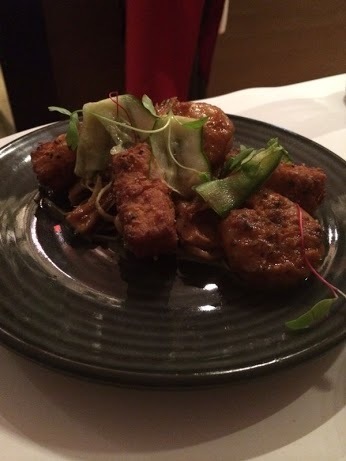 The prawns came with salt and pepper tofu, oyster mushrooms and pickled cucumber. The other elements in this course, especially the cucumber, added some sweetness to the chilli prawns. It wasn't unpleasant, but my criticism lies with the fact that this course was advertised as something that it didn't really taste like at all. Our next course was another one of my favourites that evening. It consisted of smoked duck breast, with cauliflower and gruyere puree, and a cherry compote. 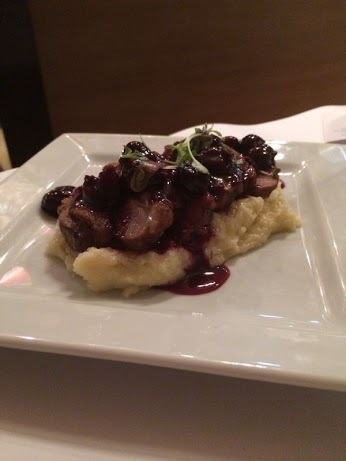 The duck breast was tender and tasted excellent when combined with the cherry compote. Duck never disappoints me when it is combined with sweet sauces, and this course was no exception. The cauliflower and gruyere puree was very creamy and cheesy. The gruyere was the element that made the cauliflower puree delicious. Overall, I enjoyed the duck the most out of all the courses we'd been served that night. After the duck came a trio of pork. 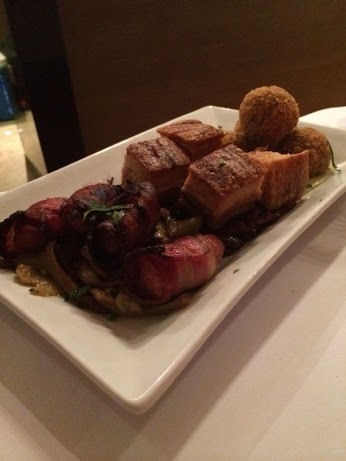 The trio of pork included pork that had been cooked in three different ways. There were pigs in a blanket; pulled pork croquette with an apple puree, and crispy baked pork belly with balsamic red cabbage. My favourite part of the pork trio was the pulled pork croquette paired with the apple puree. The flavour of the pork was accentuated by the sweetness of the apple puree. The crispy baked pork belly was nice too, exactly as the title described, but I found it a little bit too fatty. The pig in a blanket consisted of sausage wrapped in a rasher of bacon. It was probably the most average element of the dish. Roasted lamb fillet; the last savoury course for the evening. Our last savoury course for the night was lamb. It was a roast fillet of lamb that was accompanied by a lemon thyme dukkah, sweet corn, snow peas, and spiced yoghurt. Dukkah, an Egyptian spice mix was the predominant flavour in this dish. As there was also a spiced yoghurt, the lamb became a mostly spicy and creamy mixture with a bit of meat thrown in. 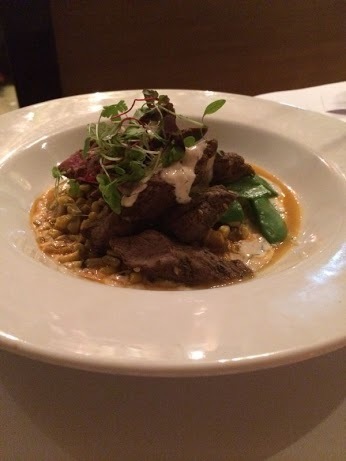 The combination of spiced yoghurt and lamb was nice, but I thought the lamb fillet was slightly dry. By this time we had been eating for about three hours, and I had also grown rather tiresome of eating. We finished our last savoury course quickly and eagerly anticipated the coming of the dessert courses. 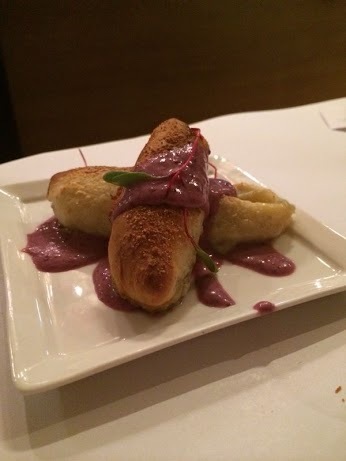 Cheese course - gorgonzola sticks with a blueberry sauce. After our last savoury course, my friends and I noticed that we had waited an unusually long time for the first of our dessert courses. I was pleased when the first of our dessert courses finally arrived. It was a plate of gorgonzola cheese sticks with a blueberry sauce. Many of our dinner courses that night had contained cheese, but several of my friends only picked at this dish. However, I quite enjoyed the cheesy and creamy concoction and finished mine as well as several others. The blueberry in the sauce wasn't instantly detectable. Although the sauce had a distinct purple-blue tinge, it didn't taste like blueberry very much. 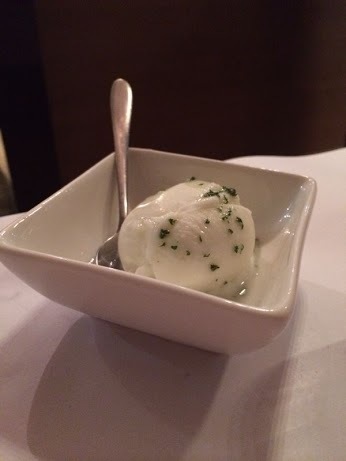 The next dish that came out was a lime sorbet. Quite plain and simple. The sorbet worked as a palate cleanser between before our last dessert. I really liked the cool, minty and acidic taste of the sorbet. 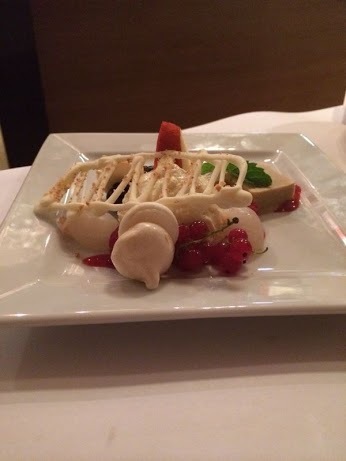 Our last dessert was a cheesecake. It was more of a variation on a cheesecake, as the biscuit base of the cheesecake had not been included. It tasted nice, but the texture was very different from an ordinary cheesecake. It was fluffier and less firm than cheesecakes I'd had in the past. 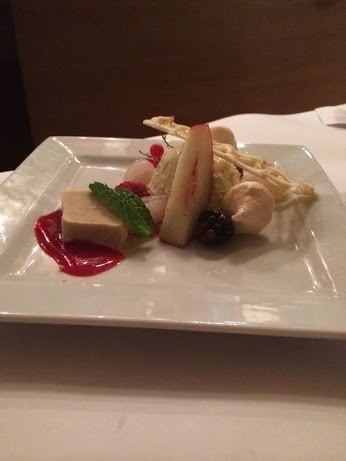 The cheesecake also came with white apricots, lychees, berries, meringue and ice cream. On the plate the ice cream was also undistinguishable as ice cream. It was a strange brownish colour, and looked like it had been cut with a knife. My friends and I weren't sure what the ice cream flavour was. I was happy to finish this 12 course meal. We had dined for about four hours, and I was extremely bloated from a night of feasting. 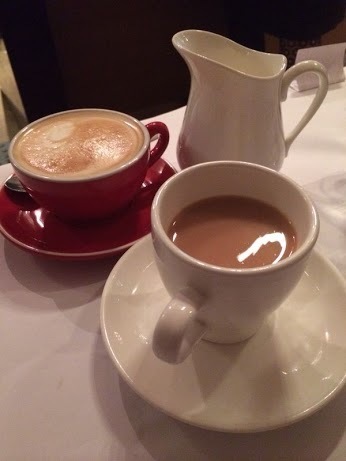 After our last dessert, we were served our choice of tea or coffee. We finished our drinks shortly afterwards, and didn't linger long after the meal. 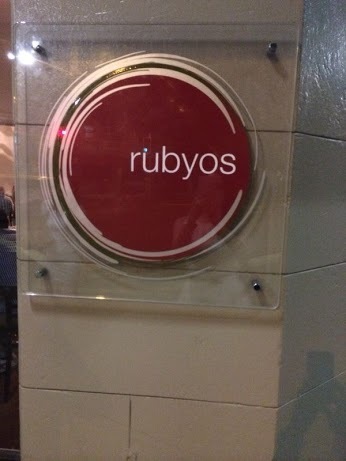 The overall dining experience at Rubyos was mostly pleasant. The service was probably one of the best in Sydney: warm and genuine, but professional at the same time. The ambience was pleasant and cosy; but it was quite loud in the restaurant, and my friends and I had to speak quite loudly in order to be heard by each other. Although I'm unsure of whether that was a result of it being New Years Eve, or whether the restaurant is generally noisy on other nights. I enjoyed the food, but it was arguable as to whether the food was worth the amount we paid. We had certainly eaten a lot, but the quality of some of the dishes had been a hit and miss. I felt that the New Years Eve banquet menu had tried to incorporate international flavours with a modern Australian touch, but had ultimately failed in getting these flavours across; especially with the Korean style soybean and chilli prawn dish, which didn't taste Korean at all. It had also taken a rather long time for some of our courses to come out, considering that we didn't take that long to eat them. We entered the restaurant at 6:45pm, and left at around 11pm that evening. The act of eating actually became a little tedious after a while. Although I mostly enjoyed the food, I wasn't sure if what I had eaten was worth the amount I paid. I'm also unsure as to whether I will dine at Rubyos again in the future; but if I do, I'll be certain that it's not for another 12 course meal. When: Dinner from 5:30pm Tuesdays to Saturdays. All day breakfasts starting from 9:30am Saturday and Sunday, and lunches from 12pm on Friday, Saturday and Sunday.